Ankylosing Spondylitis: What Is It, and How Is It Treated? Ankylosing Spondylitis: What Is It, and How Is It Treated? When you’re dealing with back pain that won’t go away, your mind probably jumps to causes like overuse or age-related wear and tear. But in some cases, joint pain in the spine comes from a form of inflammatory arthritis like ankylosing spondylitis (AS). Back pain is the hallmark sign of AS, but unlike pain from mechanical back problems, with inflammatory back pain, symptoms tends to get better with movement. Ankylosing spondylitis pain tends to be at its worst at night and early in the morning, says Bharat Kumar, MD, associate rheumatology rellowship program director in the division of immunology at the University of Iowa Hospitals and Clinics. “The proposed reason is because when you’re still or at rest, there’s a lot of swelling and water that goes to the joints, and that can cause inflammation,” he says. “When you start to move around, the water gets pushed out, and the swelling is decreased.” Here are other differences between mechanical and inflammatory back pain to pay attention to. In classic AS cases, the pain, swelling, and inflammation starts in the sacroiliac joints, where your spine and pelvis connect, though it could also start farther up the spine, says Santa Fe rheumatologist Hillary Norton, MD, who has AS herself. Ankylosing spondylitis can also involve joints beyond the spine — called peripheral joints — such as the shoulders, ribs, hips, and feet. As ankylosing spondylitis progresses, spinal joints can fuse together, giving patients less range of movement, though not necessarily more pain. Some patients also show non-joint-related symptoms, like eye redness and pain (known as uveitis), psoriasis, inflammatory bowel disease, and fatigue. Symptoms tend to develop in early adulthood; they usually appear before the age of 45. However, there’s an average delay of seven years between those first signs and getting an AS diagnosis, because AS can’t be clinically diagnosed until it’s progressed enough to see visible damage on an X-ray. Until then, it’s known as non-radiographic axial spondyloarthritis. 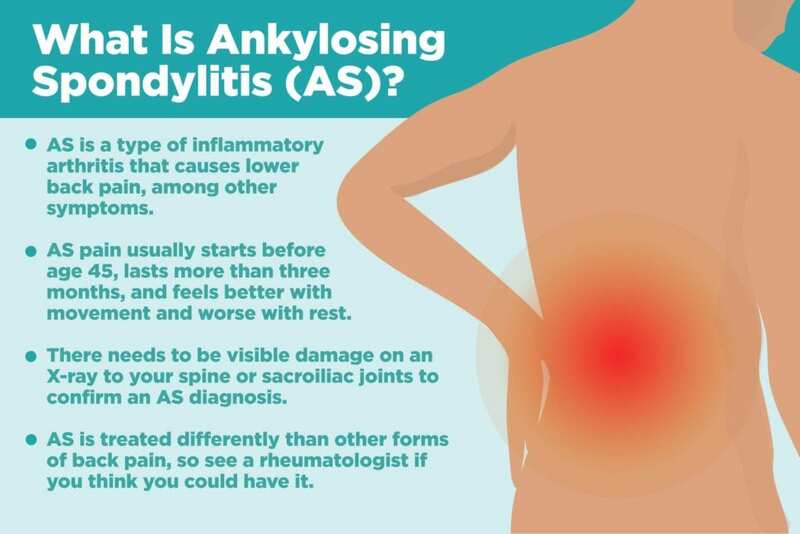 Ankylosing spondylitis is an inflammatory disease, which means that the symptoms come from inflammation in the body rather than from natural wear-and-tear. Scientists don’t know why the body starts producing chronic inflammation in people with AS, though genetics seem to play a role. Most people with ankylosing spondylitis have a gene called HLA-B27, though having the gene doesn’t guarantee an AS diagnosis. About 80 percent of HLA-B27 carriers whose parents have AS will not develop the disease, according to the NIH. Other genes, IL23R and ERAP1, have also been connected with ankylosing spondylitis. Men are also more likely to develop ankylosing spondylitis than women; however, the discrepancy is much less than previously thought. Women may actually be underdiagnosed with AS in part because it has a reputation as a “man’s disease” and therefore symptoms might be overlooked in women or misdiagnosed for something else. Men tend to have more radiographic damage, though women tend to have worse AS-related quality of life, according to a study in the journal Rheumatology. Read more about how AS affects women differently. Ankylosing spondylitis shares a lot of overlap with other conditions under the spondyloarthritis umbrella, including psoriatic arthritis, enteropathic (inflammatory bowel disease-related) arthritis, and reactive arthritis. “There’s no strict line to differentiate one from the other,” says Dr. Kumar. For instance, a patient might have psoriasis or IBD and still be considered to have AS, says Dr. Norton. Like other types of spondyloarthritis, symptoms typically include back pain, and a rheumatologist will take all symptoms and test results into account to pinpoint the diagnosis and treatment plan. 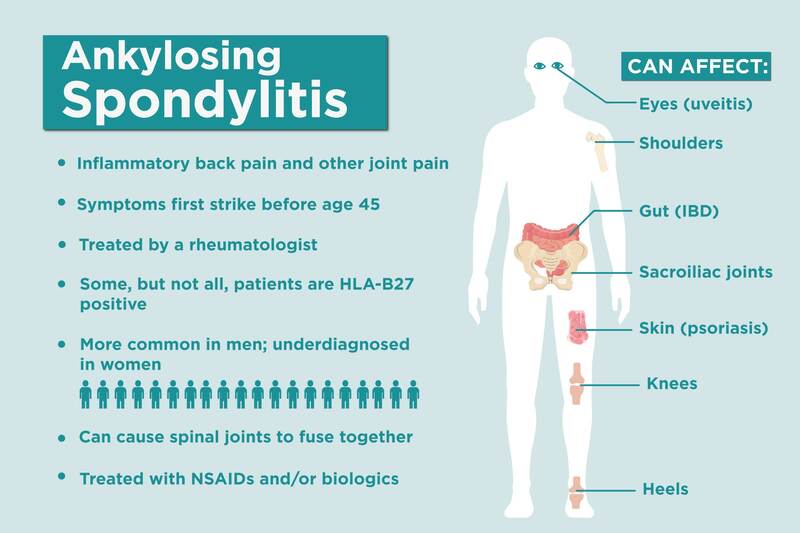 Ankylosing spondylitis is considered to be a “seronegative” form of arthritis, which means that patients don’t have the same biomarkers doctors would expect to see in people with rheumatoid arthritis, such as rheumatoid factor or anti-CCP. There’s no hard-and-fast test for AS, so rheumatologists need to consider symptoms and medical history, along with blood tests and imaging, to determine a diagnosis. A doctor will likely order blood work to test levels of inflammation and, in some cases, to check for the HLA-B27 gene. X-rays and MRIs are what really set AS apart from its earlier stage, non-radiographic axial spondyloarthritis. “It can take up to 10 years for any changes to show up on the X-ray, which is why diagnosis is so difficult,” says Dr. Norton. Signs of the disease that could show up in the imaging results include sclerosis (bony thickening in the joints), joint erosion, new bone formation, and “bamboo spine” (back bones that have calcified and become rigid). Read more about how doctors diagnose ankylosing spondylitis here. 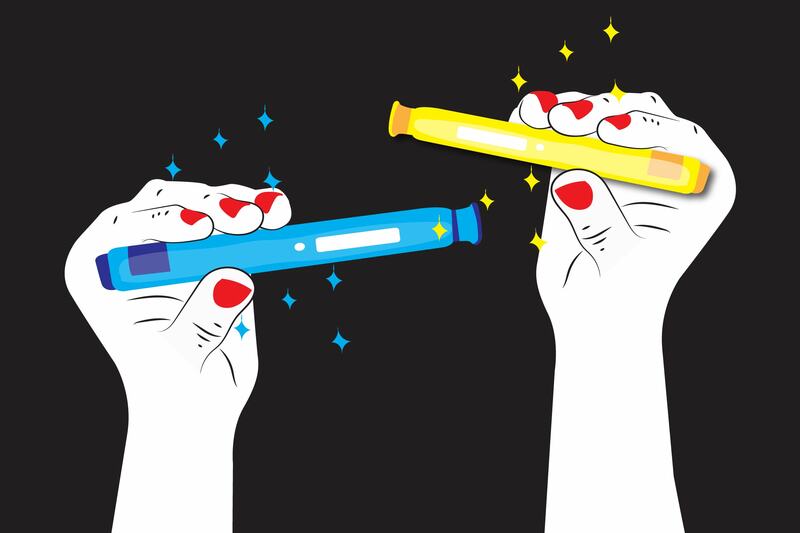 There’s no cure for AS, but there are ways to ease the symptoms and slow its progression. The official American College of Rheumatology AS treatment recommendations include non-steroidal anti-inflammatory drugs (NSAIDs) as a first line of treatment, though Dr. Norton points out that by the time most patients see a rheumatologist, they have tried those already. From there, rheumatologists will generally prescribe biologic drugs like TNF inhibitors, which block certain proteins made by the immune system to reduce inflammation. Other kind of biologic drugs approved for AS target different parts of the immune system to tamp down inflammation. Exercise, especially through the help of a physical therapist, can also be key in keeping pain at bay and improving posture. Check out these daily stretches for AS that experts recommend.